A flat roof offers a number of great benefits for your Middletown area home. In addition to being a low-cost roofing option, it will also allow you to fully utilize the space in your home. So, a flat roof will prove to be a great investment for you, and it’s an investment you’ll surely want to maintain as best you can for as many years to come. Because of its flat design, a flat roof is unable to level off excess water as well as a pitched roof is able to. Still, it is made to be able to have excess water removed. Of course, over time, your home is bound to settle, and doing so, it will cause your flat roof to lose much of its ability to level off water. This problem can lead to pooling water and, ultimately, roof leaks. While this problem may come as bad news to you, the good news is that it’s easy enough to detect. 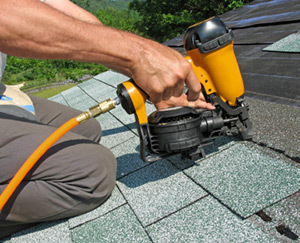 To do that, simply check the top of your roof on a routine basis, or have your roofer come by for annual inspections. If either of these efforts reveals pooling water, you need to get your flat roof repaired. To avoid and prevent these problems, you need to take any cracks of any size in your flat roof seriously. If you happen to notice any of if a routine inspection reveals any, you need to call for a flat roof repair ASAP. Flashing is a feature common to all roof types, and common to all roof’s flashing, your flat roof’s flashing will be subject to regular expansion and contraction. This will happen as the temperature rises and drops, and in time, this expansion and contraction can cause your flashing to pull away from your roof. When your flashing does this, your roof will be exposed to water damages, termite infestations, and a host of other bad — and costly! — problems. Before damaged flashing can lead to these other problems, you need to take the cue to call for a flat roof repair ASAP. Have you detected any of the problems mentioned above? If you have, you don’t need to waste a moment: Call the Middleton roofing contractors at Serrano II. We can provide quick, high-quality flat roof repair services that will get your roof back in the best possible condition, no matter what damages it might have suffered through the years.